← Overcoming Post Marathon Blues! Juicing has been a daily supplement to my dietary routine following my first marathon. The immune system is weakened for the first few days of the recovery process. 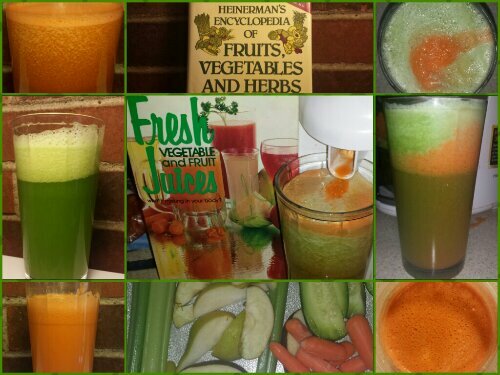 I was introduced to juicing over 10 years ago when my Mom handed me a glass of carrot, celery and apple juice. Since then, I have gone through mostly summer month juicing phases. I still use the juicer from my first sample. The model is: Hamilton Beach 67800. They have them on Amazon for 40 bucks. It’s easy to clean and serves it’s purpose. ◆ Beets- Good for the blood. Stimulates the lymph system. Cleans the liver, gall bladder, kidneys and prostate. ◆ Carrots- Increases vitality by preventing infections. Protects the nervous system. ◆ Celery- High in fiber, magnesium and iron. ◆ Cucumber- High silicon content promotes hair and nail growth. ◆ Spinach- Good for the digestive track. I will keep it juicy as long as my body is craving these nutrients. My energy has increased and my nails are noticeably stronger. This entry was posted in food, marathon, running and tagged health, juicing, natural remedies.. Bookmark the permalink. I’ve always wanted to make juice and/or smoothies with beets! The only downside to beets is cutting those bad boys up. I hear you can cook them and that helps? I want to try juicing…I’m just not sure I’ll do it right. I know so many people who do it though. I mainly use carrots as a base and add whatever I have available. There are books and info online that give recipes for specific ailments.